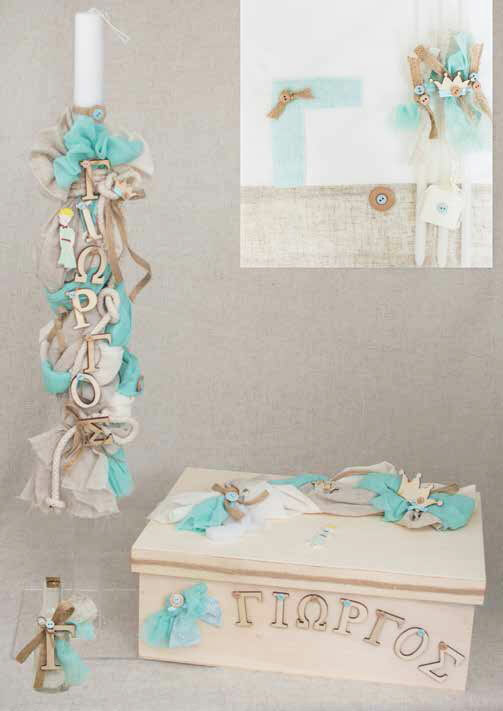 Beautiful romantic and at the same time elegant baptismal set, with the name of your little prince. The child's name is tied with a thick beige cloth rope with wooden letters on rich fabrics in light brown and saliva colors. The set has a large wooden box decorated with light blue bows and the child's name on it. The set includes: candle, wooden box-suitcase, three candles, soap, bottle of oil, ladopana, lingerie and towels. https://www.preciousandpretty.com/2018/11/personalized-christening-set-for-boy-E810.html Greek Wedding Favors|Orthodox Crowns|Stefana|Baptism Invitations Personalized Christening set for boy E810 Greek Christening set for boys, with the name of child on the lampada and the wooden box. Product #: Greek Wedding Favors|Orthodox Crowns|Stefana|Baptism Invitations_6207252875942986362 5 stars out of 5 reviews.